Adding to the long and illustrious list of Irish themed online slot games, the Lucky Leprechaun is back and is happy to help you on your journey over the rainbow in search of that pot of gold. Watch as the crazy little leprechaun does a little dance following every win. Wins can be registered by matching the Irish symbols and playing cards across the paylines and undoing the Irish charm that’s within us all. Microgaming are the origin of online casinos, having created the first real online casino in 1994. As award winning developers, they believe it is their duty to deliver unique, quality games. So far, they have succeeded, creating over 850 unique casino games, and over 1,200 variants, with both licensed and original content. 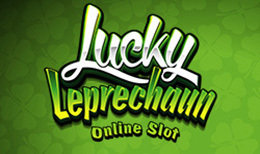 Lucky Leprechaun is a 5 reel, 20 pay-line online video slots game based around the luck of the irish. Inspired by the legend of the leprechaun, this slots game is full of st patrick's day fever, with cheerful music, bright colours and (of course) lots of green and gold. The rels themselves are lined with gold and set against a backdrop oa green, hilly area with a clear blue sky. In order to start the game, the player must set their wager. Players can change their wager using the “Bet” button to set coin value/size (0.01 to 0.10), and coins to set the number of coins to be bet per line. The reels are set in motion using the “Spin” button, and the “Auto play” feature can be used to allow the game to play automatically for a number of turns determined by the player. The Wild Symbol is the game logo, and can substitute for any and all symbols excluding the bonus and scatter symbols. This symbol can also form its own winning combinations, as well as substituting for other symbols in a winning combo. During the base game and the free spin feature, Wild symbols will appear stacked on a reel. The Scatter symbol is a four leaf clover, and appears only on reel 5. Once the player lands this symbol, they are awarded 5 free spins, along with a 2x multiplier for all wins during the free spins. If the player lands either a green or gold shamrock attached to one of the lower paying symbols during a free spin, they will either gain a multiplier or an additional spin. Multipliers go up to a maximum of x5, and the leprechaun can become wild during free spins. The Bonus Symbol is a pot of gold. If the player lands 3 or more of these symbols anywhere on the reels at one time, they will trigger the Trial o’ Fortune Bonus. During this bonus game the player is awarded 4,5 or 6 spins, with each additional bonus symbol adding one to the multiplier. Spinning the wheel helps the player along the track, and players can cross rainbow bridges to get ahead and discover emeralds to gain an extra spin. Lucky Leprechaun is a fairly decent slots game, with some interesting gameplay features. The game is well built, and if the player isn't careful, they will lose hours on their day to the promise of the gold beyond the rainbow. The games Jackpot of 1000 coins isn't the largest, but the game's charm and frequent smaller wins still allow for the player to enjoy themselves even if they don't win big.